The map should be dropped. It's not necessary, as there's many other symbols that could symbolize properly the island, and it isn't a remarkable shape. The reason why the map was needed: empty space. Actually, there's empty space everywhere. Personal experiences made me know 1:2 ratio isn't ideal to handle diagonal designs. Papua-New Guinea, for example, uses a 3:4 ratio; I'll use a more conservative one: 3:5. This bird, the golden bosun (symbol of the island), is turned to the wrong direction: tradition and good-taste tell it should be turned to the hoist. Moreover, I would come with a new design. I hope you liked the design. Happy Christmas to everybody! Your comment is very welcome. Please, comment. No, I don't stopped my Christmas dinner to post it. This post was previously programmed. Today it was announced that part of British Antarctic Territory will be named Queen Elizabeth Land, in occasion of Diamond Jubilee. 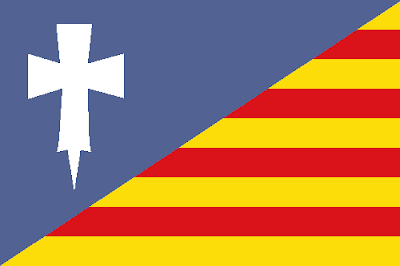 It's a good opportunity to imagine how this land's flag should look like. Samuel McKittrick, in his own blog, showed his proposals. 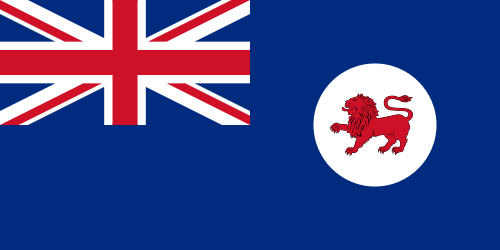 Now I'll show the mine; it doesn't necessarily means I support the British monarchy or its claim in Antarctic lands — it's s blog about Vexillology, not Politics. The background is formed by white and blue lozenges. Firstly, it emulates diamond shape (a reference to Diamond Jubille). It also is used because it slightly resembles the ice. 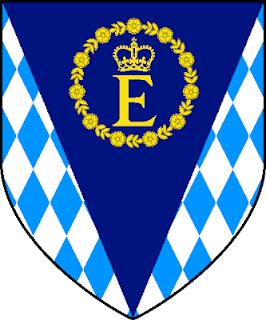 There's a blue triangular division, with royal cypher on it, as reference to the person whom the land is named for. The cypher contains the crown, so I don't thought it's needed to crown the shield. It was only a supposition training; I don't know even if this land will ever adopt a flag. Please, leave a comment, and help enriching the blog. I suggest the visit to Samuel McKittrick's post about the same issue. Click here. 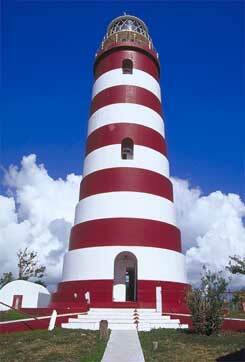 Do you know where Abaco Islands are? Probably not, except if you're Bahamian or collect bad flags. Because the islands sure have one of them. 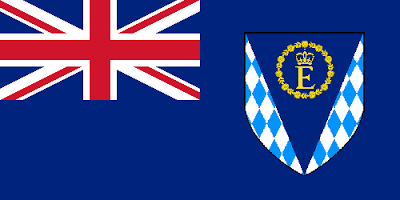 Actually, it's not the local flag, that they apparently haven't, but the flag of the (apparently) defunct Abaco Independence Movement, that wanted to became a separated British colony (there was even a proposed governor flag). For now, I should say I'll keep politically neutral on this post. The flag isn't very good (in some depictions, it's showed even worse). There's a lot of problems on it. 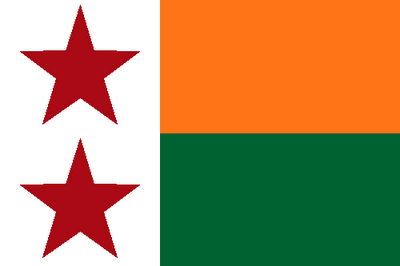 Firstly, the flag is overloaded on the right, what means that, on low wind, the flag is indistinguishable. I count seven colors on it (blue, yellow, orange, red, white, gray and black). Too many, for me. And this lighthouse (it's a lighthouse, if you haven't perceived yet) looks like the Tower of Pisa, but it's very straight. 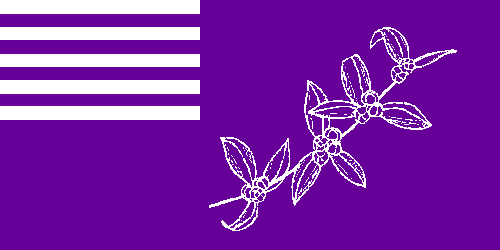 I'll keep the same elements of this flag, only create a better pattern. 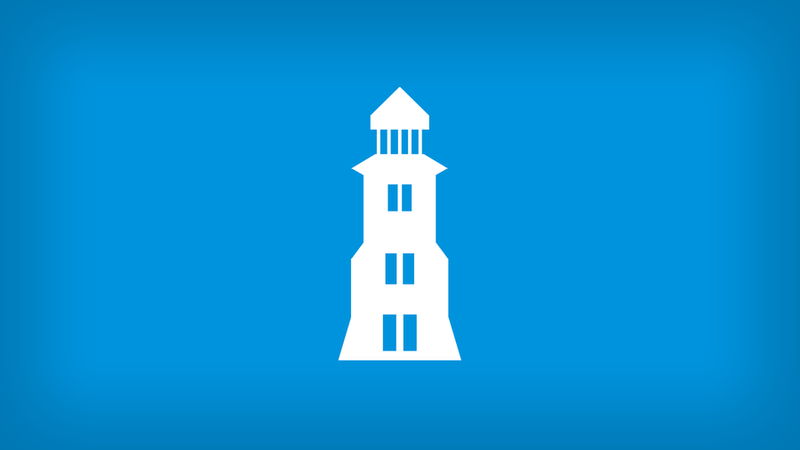 The lighthouse represents the Hope Town Lighthouse, the islands' most famous landscape. 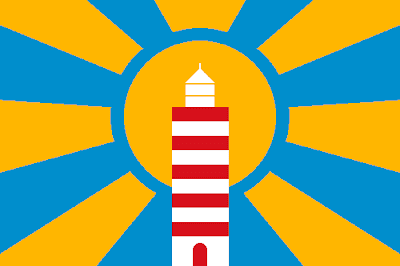 The sun represents freedom on original design, but I'll use as reference to local climate. 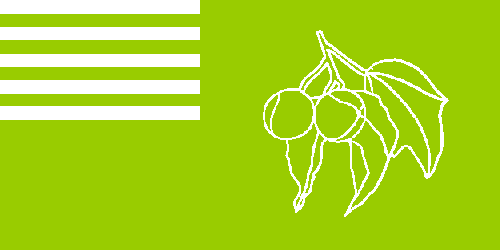 The result isn't as good as I wanted, but's still better than the original flag. 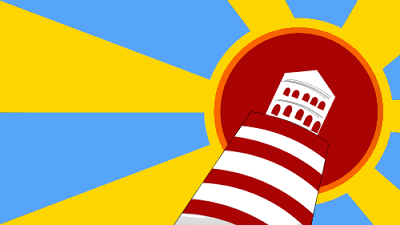 The flag is more symmetric now, and I preferred the stylized lighthouse in place of the more "cartoonish" one. Four colors are still very many, but obviously less than seven. It's my self-concept to this proposal: not excellent, but better than the original. But I'll repeat: I'll not express my personal opinion on Abaco issue. We're only discussing vexillology. 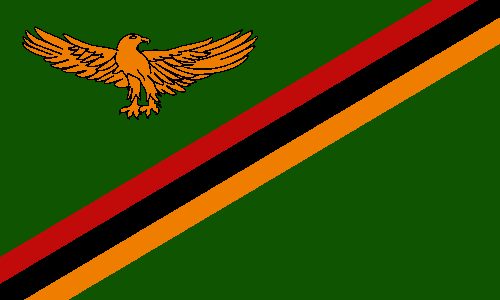 This interpretation of the flag is from there. I know that was a long time since I published my last post, but I promised it'll return to standard rhythm on January. 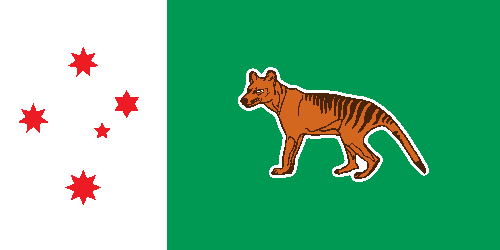 A white border to contrast better, and red is also used to represent Tasmania. Being sincere, I still prefer my first design. Your comment is very appreciated. Please leave a comment. Probably the blogging rhythm will be altered until the New Year. After that, it returns to standard frequency. The Daman and Diu territory has a special history in Indian subcontinent. Together with Goa, and Dadra and Nagar Haveli, they were part of Portuguese Empire for centuries. 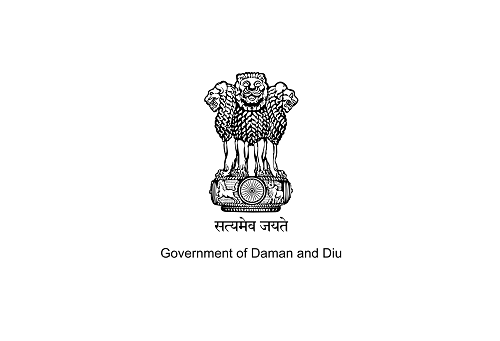 Daman and Diu were Portuguese colony for more than 400 years, only being transferred to Indian control in 1961. 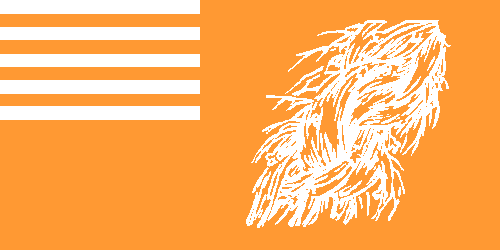 I once made a flag for Flores (Indonesia) and Ouidah (Benin), with similar histories, and now I continue these series of former Portuguese colonies. This flag hasn't even their own seal, but the federal emblem. An improvement is needed urgently. 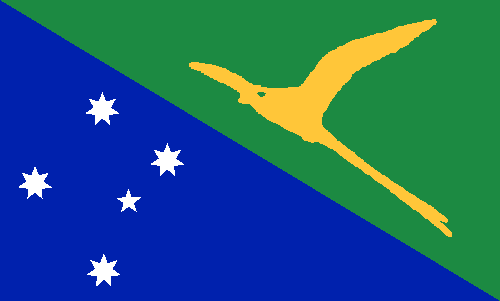 I think this way the flag became more original. I hope you liked. Please, leave a comment. It riches the blog. 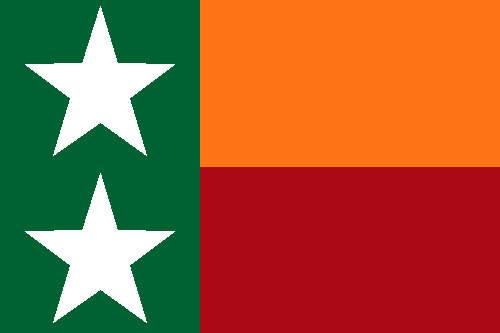 Note: although some Indian unofficial flags have autonomist or secessionist connotations, I tried to keep neutral on the issue. My point of view is that these flags, purely by aesthetic reason, should replace current government flags. I'm inviting you to my new blog: Flags of U.S. States. There you'll find my opinion about what are the best flags to each American state. 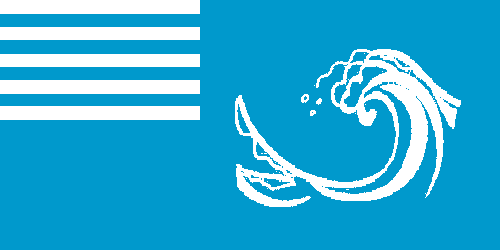 All the flags are still done, so it's only time question to post them. About 25-30% of them are totally original designs, made by myself. 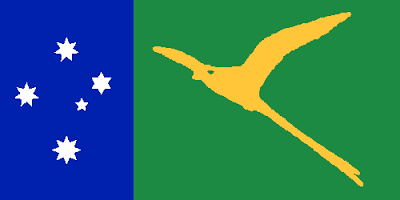 The others are current flags, historic flags or flags proposed by other people (the correct credit is given to their respective authors). To enter the site, click on the link or in the image banner on lateral bar. Thank you. I hope you like the visit. 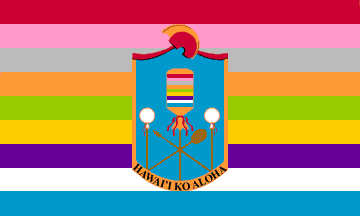 Sometime ago, I tried to find examples of Hawaiian local flags on web. I haven't find a lot of them, only the flags of Honolulu and Oahu counties. 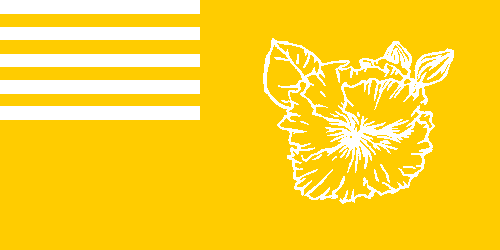 So I decided to create a flag to every major Hawaiian island; they're nine. Every stripe of the flag corresponds to an island. There are nine of them, as the number of major inhabited islands on Hawaii archipelago. Just below you can see the flags I idealized to them, and its color and the official emblem of the island (from where the colors were took). 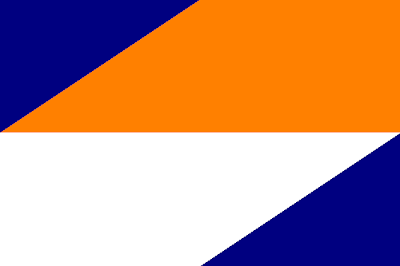 They follow a template: bi-chromatic, with allusion to nine stripes on superior left canton. 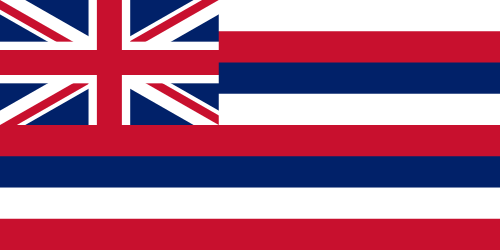 The nine stripes appear on Ko'Aloha flag (above), but also on Hawaii official state flag and Kanaka Maoli flag (used by independentist movement). Hawaii Island Red, from lehua blossom from oahi tree. Maui Island Pink, from lokelani flower. Kahoolawe Island Gray, from hinahina plant. Lanai Island Orange, from kaunaoa plant. Molokai Island Green, from leves of kukui tree. Oahu Island Golden yellow, from ilima flower. Kauai Island Purple, from mokihana flower. Niihau Island White, from pupu shells. Nihoa Island Blue, from blue sky and water. 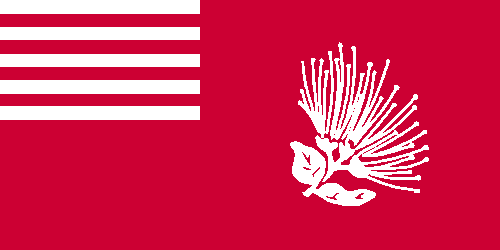 Curiosity: do you know that the official Hawaii flag is the hibiscus? I'm thinking about use it to uninhibited islands, maybe black. And this is it. Thank you for reading! Your comment is very appreciated! It's your way to help me improve the blog and the designs. Thanks in advance. That's the series I promised about two weeks ago. Debt paid! I'm thinking about create more geometric models. If possible, I'll be replacing the flags one by one. If you're interested on theme, see related bibliography:  and . Samuel McKittrick, in his personal blog, noticed an interesting issue: the use by Ulster flag by the counties of Republic of Ireland that constituted the historical province of Ulster. What's the big question? 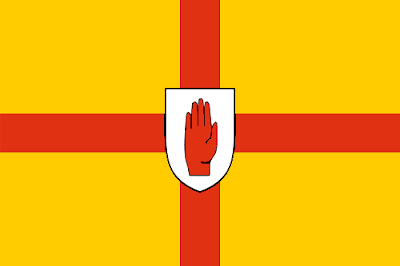 Republic of Ireland only holds three of Ulster nine counties (the other six counties are in United Kingdom's Northern Ireland). 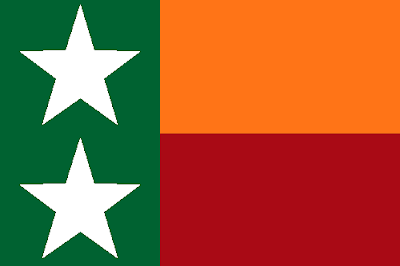 Why not a special flag to denote the three counties (Donegal, Monaghan, Cavan) have different statuses. What are the constituents of Ulster flag, that can be seen in both flags: the red hand (from the coat of arms of O'Neill dynasty) and the red cross on golden field (from the House of Burke). The O'Neill were kings of Ulster, and the Burke (or Burgh) were earls of Ulster. It's not 100%, but it can be used without problems. Your comment is welcome. Thank you for reading. The series I promised last week isn't done, but soon it'll be published. 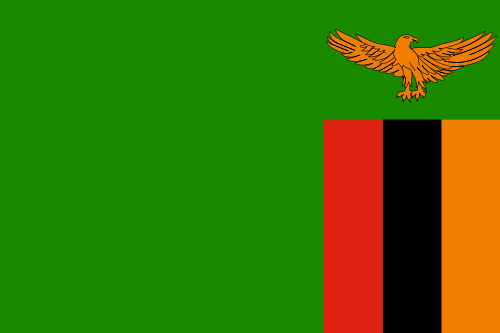 The Zambia flag is a common topic in flags redesign discussions (see example). I'll show the flag and so it'll become clearer. The major elements of flag are set on the right, so they're hard to be seen in the wind (see for yourself). Also, this green shade is a little eye-unfriendly for me. 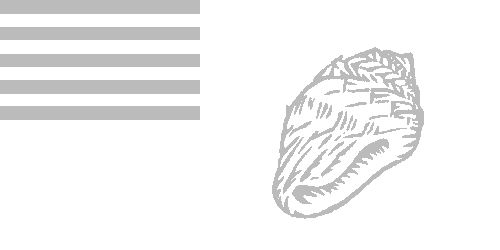 The vertical stripes were rotated 90° to right, and the eagle was moved to the left, making the flag more "balanced". The green and red shades became darker, making it more contrasting and less eye-tiring. As final touch, the eagle was put leaning on red stripe. 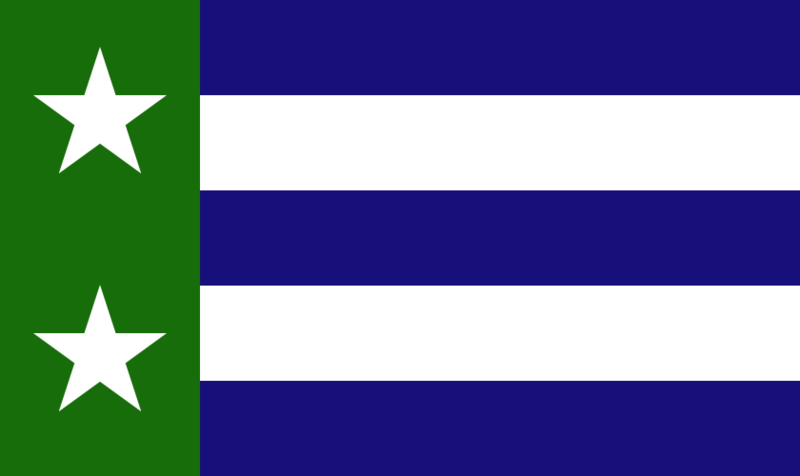 The colors are the same of previous flag, but the arrangement is better: diagonal stripes crossing two green halves. The eagles is flying on first division, making it more visible. Now, I'll explain the meaning of elements of Zambian flag. Firstly, the colors: green for the lush flora, red for the blood fallen on fight for freedom, black for Zambian people and gold for natural resources and mineral wealth. Now, the reason because I only made this explanation in the end: the eagle must be, necessarily, flying, because it represents the rise above nation's problem, but on first flag it's leaning. 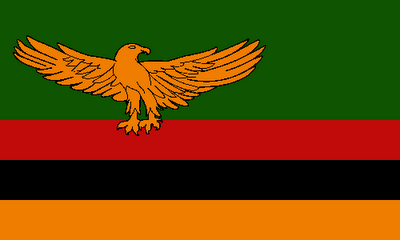 It was corrected on second flag, that I consider the best I made to Zambia. Your comment is welcome; please, feel free to show your opinion. 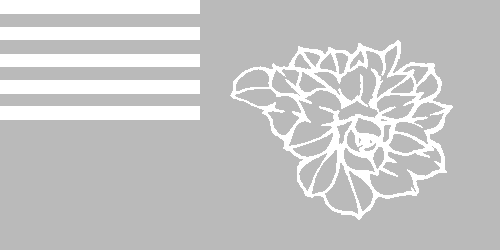 I'm working on a set of flags. If it ends soon, I'll post it next week. At first quarter, the arms of the County of Sobrarbe. 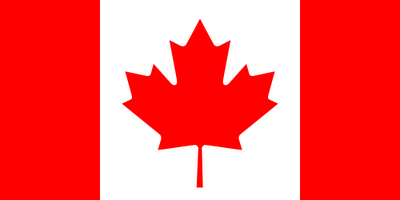 Too complicated to be in the flag. At second quarter, the arms attributed to Iñigo Arista, the first king of Navarre and probably count of Sobrarbe. There's no evidence it was really used, but it's a cool symbol. 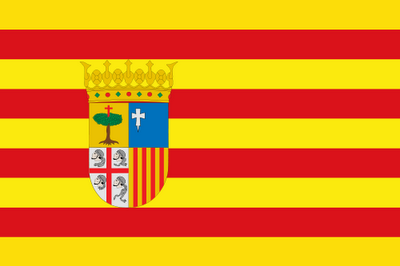 At third quarter, an allusion to the flag used in the Battle of Alcoraz (1096), during the war against Moors. This is used as flag of Sardinia (the Moor heads are, in Sardinian flag, incorrectly turned to right since 1999). A plain version (St. George's cross) is also very popular, but it's the same insignia used by England, Milan, Genoa and many others. 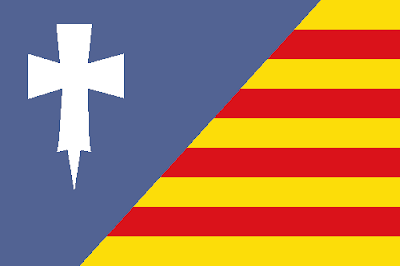 At fourth flag, the arms of Crown of Aragon, currently held by Catalonia. Also, combining vertical and horizontal stripes would create an undesired effect. I think the results are interesting. What do you think about the post? Your comment is welcome! Talking about so old arms can cause controversy, because the historic sources are sometimes contradictory If you have a different information, please share it on comment box. Reading an interesting Tumblr blog about new United States and Canada flags (visit it), I knew about a proposed flag to Michigan state. The explanation by flag designer (Christopher Zervic) can be found here. Here you can see current flag and, underneath, the proposed flag. 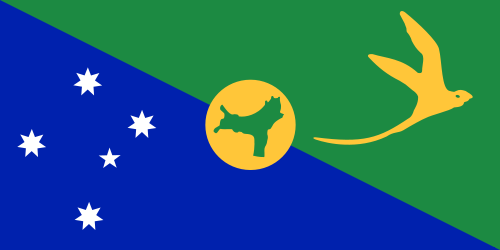 I don't need to explain what's wrong with current flag, the author of the proposed flag explains it good (and I totally agree with him). The Mr. Zervic's proposal is really interesting. 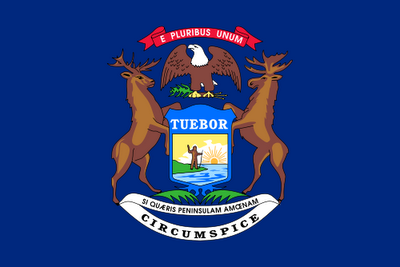 Let me explain some facts about it: the two stars represents the two peninsulas that constitute the state, green is for land's fertility, and the five horizontal stripes represent the five Great Lakes (although only four of them waters the state). I divided the green part with a blue stripe, as they are divided by Lake Michigan. The lakes themselves are represented by five smaller stars. The white stripes are only fimbriation. 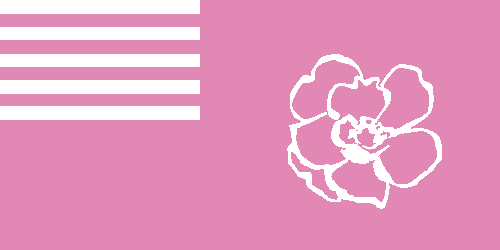 After I designed it, I made a little research and found that it's similar to a proposed flag to Minnesota (see it). It's a hard life! Every kind of comment is welcome. Promised and fullfilled: two posts this week. 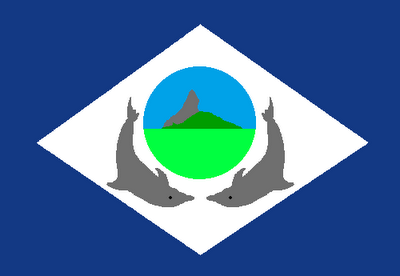 When I did my series about Brazilian state flags (see intro and epilogue), I originally planned make a flag to Fernando de Noronha, what didn't happened. But now I'll do it. Before explain the changes, I'll explain what I kept: a landscape of main island, including its "great rock" and the dolphins — apart from having some of most heavenly beaches in the world (with excellent options to surf, snorkeling or just sea bath), it's considered the best point of dolphin-viewing of the world. 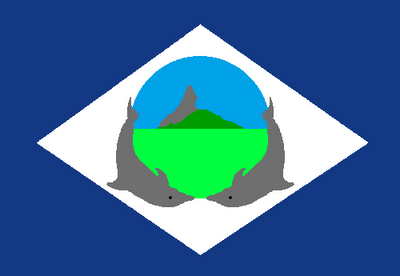 The first proposal shows the landscape in a circle, with the pair of dolphins being used as a kind of "supporters". 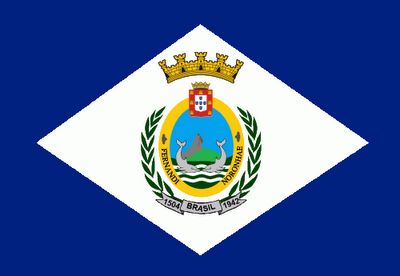 I prefer this one, because its designis clearer and, for me, resembles more the Brazilian national flag. 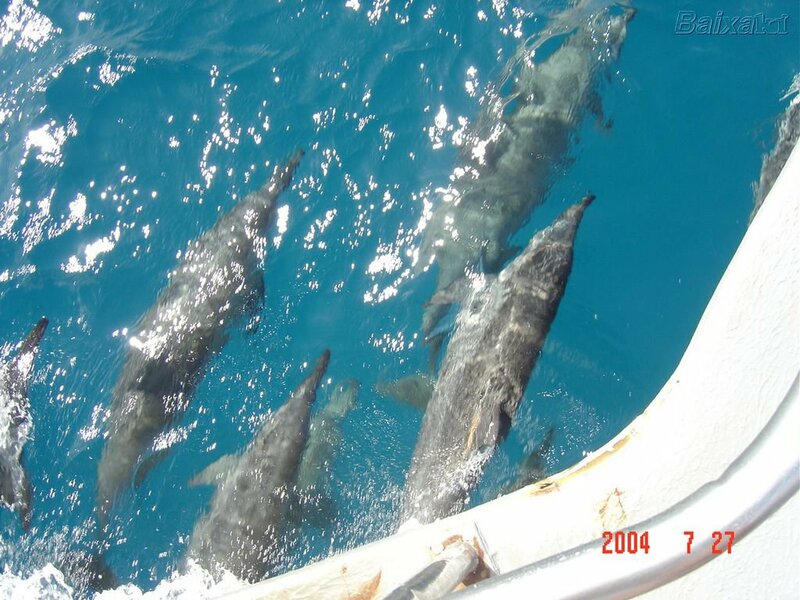 The second, although, is more "natural" because shows the dolphins as part of the landscape, diving in the sea. Other change was the inversion of green shades: I'm sure the mountain is greener than the sea. A problem these flags still have is the different shades of blue and green, that I couldn't solve satisfactorily. All the comments are welcome. Would be a pleasure if you subscribe the blog. Thank you! 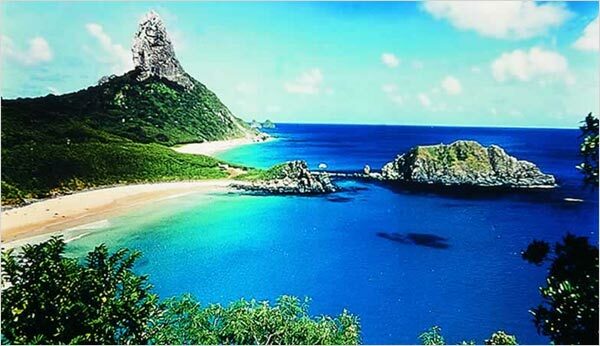 Before somebody ask: no, I never was in Fernando de Noronha... so far. Antofagasta is the only Chilean region without its own flag. 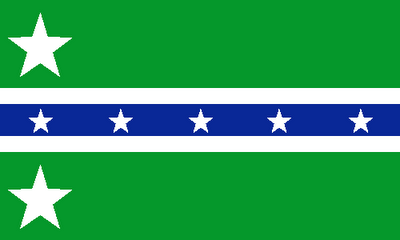 About a month ago, the region's intendant (the term is equivalent to "manager" or "steward") released a competition to choose a new flag (see a news link here). Apparently, only region's inhabitants can post a proposal, but I created my own anyway. 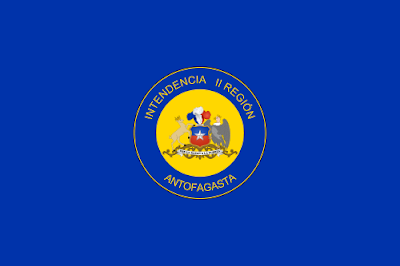 That flag is a blue field with a seal consisting of Chilean national coat of arms and a inscription "Intendencia II Región - Antofagasta", that I freely translate as "Administration of Region II - Antofagasta". It's ugly and indistinguishable. I tried to use the Litoral department colors, but it increased too much flag's complexity and decreased the flag's visual impact. Blue is for the ocean: the capital city, Antofagasta, is a great port. The first arrow, pointing to the ocean (see Chile map), represents mining, the biggest economic activity of region. The orange color represents copper, more important and commonly found ore in region. The second arrow represents second biggest economic activity: the tourism, oriented mainly to pre-Columbian archaeology sites and the salares (salt pans). Salt also represent an important role in native ancient inhabitants' life, so it also represents them. Thank you for reading. Your comment is very appreciated. In Canada, the discussions about a possible flag change are very polemic, dividing people between pro-change and anti-change. 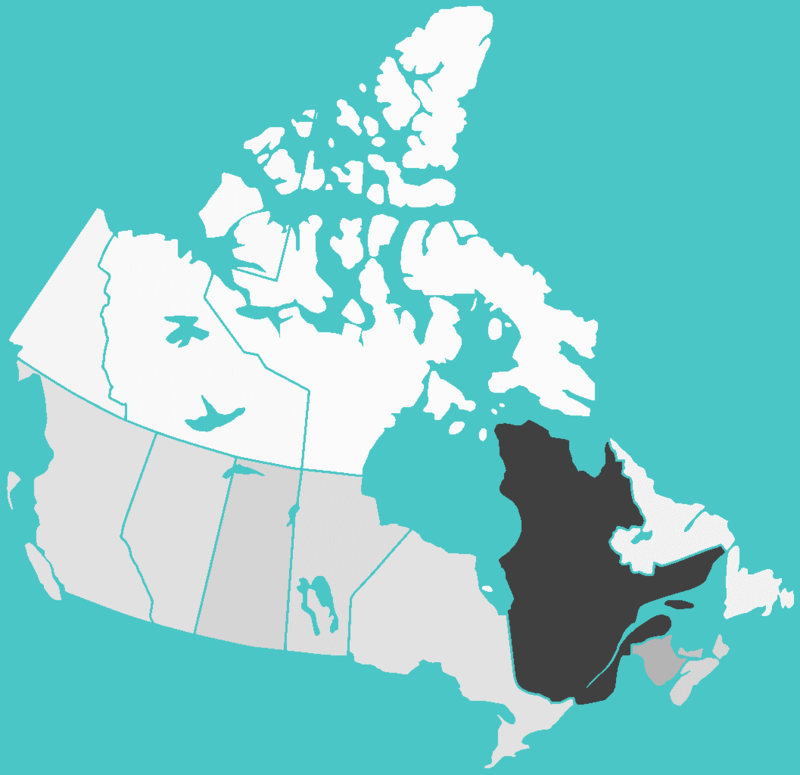 One of bigger reasons to change (I'm not saying it's my personal opinion) is that, while Canadian population is basically constituted by Anglophones and Francophones, only the firsts are represented in the flag. 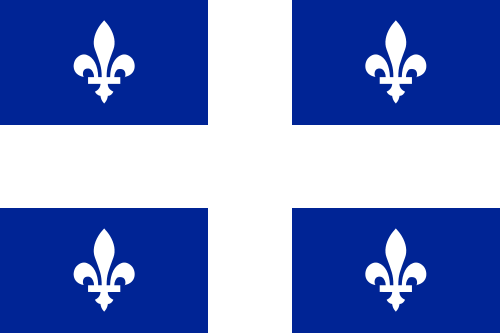 Also, it opposes the French national flag's color order, to avoid any misinterpretation. 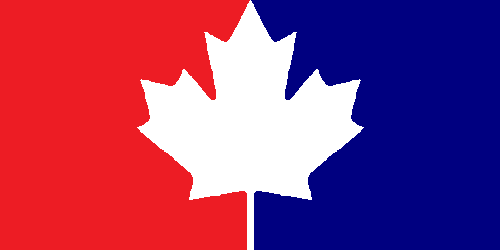 Finishing, I'd note that it's more a proposal to a new "duality flag", although it could, occasionally, be proposed as Canadian national flag, what I didn't pretend to do at the moment. Your comment is always welcome. Please feel free to express your opinions. Thanks for reading! If you liked the blog, you may like to follow it (button is on the left). I'd like to clarify that it's not my intention express any political opinion in this post. 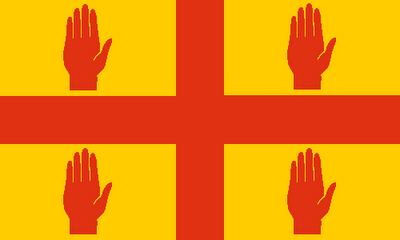 My friend Samuel McKittrick designed a flag to its own city, Londonderry (as unionist usually name it) or Derry (as nationalist usually prefer), the second biggest Northen Irish city (see the post here). It's going to be the first UK City of Culture, in 2013, so it's a good time to build a flag. Just above you can see two flags: the first is the unofficial city council's flag and the second is my favorite Sammy's proposal. Let's explain them: the first flag depicts the coat of arms, also symbolized in second flag. 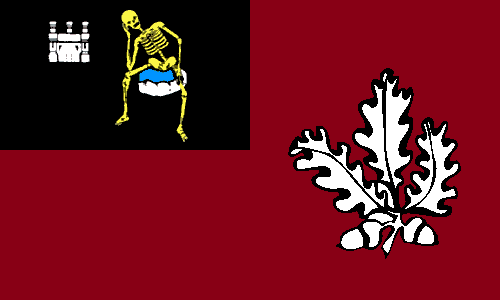 It depicts a skeleton (or the Death) on a stone with a castle in left. The real origin of the meaning is unknown, but it's popularly said to represent the castle of the 2nd Earl of Ulster, Richard De Burgh (1259-1326), being the skeleton from one of his knights and cousin, starved to death on castle's dungeons. In the chief (top of shield) there's London coat of arms (sometimes with a harp on center), added when city changed its name from Derry to Londonderry. 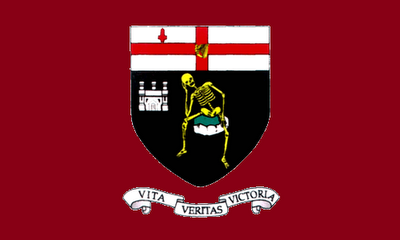 The field of both flags is a crimson, representing the crimson flag, firstly flown during the Siege of Derry (1689) as symbol of defiance. Sammy's flag contains badge with a oak leaf and a stronghold, taken from a memorial in Guildhall square. The oak represents city's origins and name (Doire means "oak grove" in Irish). The bastion is a reference to the city's insurmountable walled city (hence city's nickname "maiden city"). 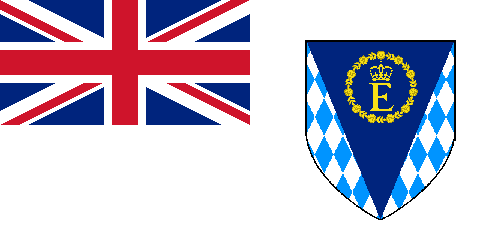 In the first flag, the coat of arms. 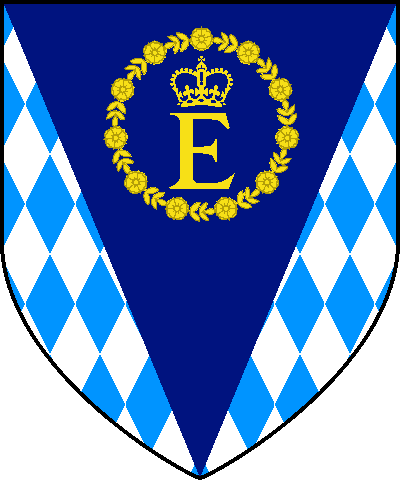 I didn't use the London banner of arms to avoid somebody concluding that city has any formal relationship with the English city. The field is crimson, the same shade of flags above. I use the same oak leaves from Doire team in GAA (Gaelic Athletic Association). 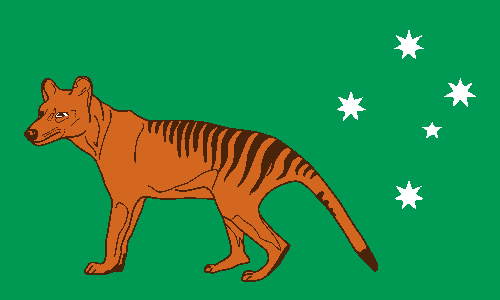 I'm not still 100% satisfied with the flag, but still think it's reasonable. I tried a half-half version of flag, instead of a "cantoned" one, but that didn't work, for me. Thanks for reading! Any kind of comment is welcome. 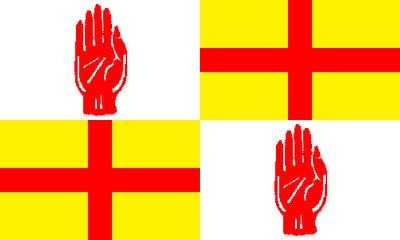 I recommend the visit to Sammy's post about Derry/Londonderry flag: click here.